You need to be knowledgeable about fire extinguishers. A fire is something that can happen to any business. But being prepared and ready for such an emergency can make a huge difference. In fact, having fire extinguishers in your workplace can really do wonders for a fire emergency. Here are just some things that every business owners need to know about having fire extinguishers in your office. Ideally, you want to have the type of fire extinguishers that are most likely to extinguish a fire that can break out in your business. 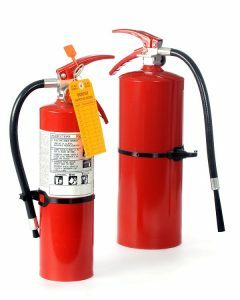 In fact, depending on the type of materials that are in your office, you may need one fire extinguisher over another. Therefore, be sure you have the proper fire extinguishers in your business to protect your company and employees from a fire emergency situation. It’s not taught to many people. In fact, the majority of people are unaware of how to properly use a fire extinguisher. But it’s a lot more simple than people think. Pull the pin: When you first get a fire extinguisher to use, you will want to pull on the pin with the nozzle pointing away from you to release the locking mechanism. Aim low: Ideally, you’ll want to point the extinguisher on the base of the fire. Squeeze: Be sure to squeeze the lever very slowly and evenly to get the best results without any injury. Sweep: Lastly, you’ll want to sweep the nozzle of the fire extinguisher from side-to-side, making sure to extinguish the entire flame. It is important to keep your fire extinguishers in tip-top shape by getting them inspected by a professional regularly. In fact, this is a requirement that could save your business in the event of a fire. This entry was posted on Friday, May 25th, 2018 at 11:33 am. Both comments and pings are currently closed.